LeBron James and Gloria James kiss: Cleveland Cavs star's mom kisses his head after ugly cut in game four of NBA Finals against Golden State Warriors. 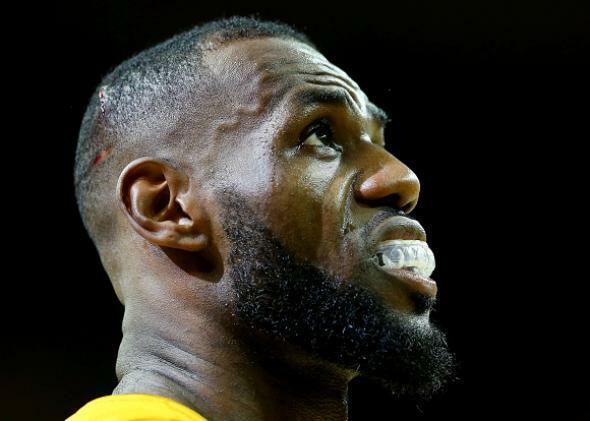 A cut on the head of LeBron James of the Cleveland Cavaliers is seen in the second quarter against the Golden State Warriors during Game Four of the 2015 NBA Finals on June 11, 2015 in Cleveland, Ohio. LeBron James has put on one of the greatest performances in NBA Finals history, but Thursday night reminded everyone that he is still only human. Even if no other human would play the amount of minutes he has in these finals (nearly 46 minutes per game), like other humans he can get tired. Like other humans, he can’t do everything himself and needs at least some support from the patched together squad of NBA journeymen that make up the remaining uninjured members of his Cleveland Cavaliers team. And like other humans, he can bleed. During Thursday’s game four, James went crashing head first into a camera after a hard foul from Australian Andrew Bogut and writhed around in pain from a nasty-looking cut to the head. (What is it with Australians this week?) Finally though, like other humans, a simple kiss from mommy helped make everything better and he quickly returned to the game. Here’s the entire sequence, including the incredibly sweet kiss Gloria James gave her only-human-even-if-he-plays-like-superman son.